As a Pharisee, he learned the Word from some of the greatest teachers in Israel. Years of study of holy texts primed his mind to seek out the truth wherever it may be found, and to commit himself to deeds of righteousness for the sake of his fellow countrymen. He rose through vigorous religious training as a Pharisee and ended up being one of the most devout religious leaders of his day. His life changed when an astonishing encounter with the Messiah showed him there was so much more he needed to learn, and this Pharisee’s focus was redirected to follow and honor the Nazarene in surprising ways – even at the cost of his life! While the above may sound like a description of the apostle Paul, the man I reference is someone mentioned by name only three times in the text of the New Covenant writings. Paul is undeniably the most famous Pharisee in Scripture to commit to following the Messiah Yeshua, but Nicodemus holds the unique status of being the first committed Pharisee from the high ranks of the religious elite who admitted that Yeshua is indeed a teacher from the Holy One. It was Nicodemus who defended Yeshua before his Sanhedrin fellows, and who followed Him afterwards at great personal cost. In this study it will be shown that the commitment of Nicodemus to observance of the Word and to following the Messiah is a truth upheld in the pages of the New Covenant, as well as in the historical records of Judaism, and provides us with a broader portrait of the man that allows us to better appreciate what it means to follow Messiah and leave it all behind. ​Yet, one man there was from the Preeshe’; Neeqadeemas was his name, a ruler of the Yeehudaye’. The details given here are significant to properly understand. Nicodemus owed his allegiance to the Pharisees – the most popular of the many religious sects in first century Israel. He was of their rank and opinion: to make a nation of priests even from the laypeople. The Pharisees, while given many admonitions in the text of the New Covenant, as well as even in Judaism’s own historical text of the Talmud, were not of priestly Levitical caste, but men who arose after the crippling detrimental effects of Hellenism among the Jewish people, who yet desired to aid the fulfillment of the dream of the Most High to have an entire nation of priests, to promote the performance of the Word’s commands in a way that would allow every man the opportunity to live as much of the Torah as possible. However, like many movements of man that begin with sincere intentions, the methodology of the movement took on more importance than the performance of the Torah itself, and that skewed aspect of the group began to burden even the most well-meaning of followers with man-made dictates the Torah never intended to be observed. It is against the upholding of those particular extra-Biblical observances over the Biblical that we find Messiah speaking out in His various “woes” to them. Their intent was absolutely honorable, and perfectly fine in many aspects, but like all fallen man, eventually became tainted with man’s inevitable trend to move focus away from the things of heaven and back on our own lives. Nicodemus was one of the Pharisees, to be certain, and yet he still held in his heart the true original purpose for his manner of walk: to please the Holy One of Israel. Furthermore, the verse above tells us that Nicodemus was also one of the rulers of the Jewish people. Not only was he an influential Pharisee, but he also held a position of authority among the Jewish leadership who kept the peace under the oversight of Rome. The historical records from Judaism tells us that this same Nicodemus (Naqdimon in Hebrew) was an incredibly affluent individual, and this factor of wealth paired with his dedication to the Torah brought about an amazing incident in first century Israel. He was in the unique placement in society to care for the people’s religious and civil well-being. The Talmud records a truly amazing incident that occurred in his life that shows the magnitude of his love for his fellow man, as well as the depth of his sincere faith in the Holy One. The story begins in tractate Taanith 19b. The account thus far displays for us the desire of Nicodemus to provide access to ample water to the faithful citizens of Israel who were traveling to the holy city of Jerusalem for one of the three Scriptural pilgrimage festivals (The Festival of Unleavened Bread, the Festival of Weeks, and the Festival of Tabernacles – see Leviticus 23). Although the festival is not named specifically, the fact that Nicodemus sought out twelve wells (or cisterns) for the pilgrims to use implies that it was probably one of the week-long festivals – either Unleavened Bread or Tabernacles. The payment he offers for the access and use of the water is either replacement of new water, or the value of it with twelve talents of silver. A talent is a weight reference used in the ancient world, and varied in set weight between cultures. According to the first-century Jewish historian, Yosef ben MattitYahu (better known as Flavius Josephus), in his work Antiquities of the Jews, vol 14, he recorded in Judea (the area in Israel wherein Jerusalem was located), that the talent was set at the version known as the “heavy common talent,” which placed its weight at 130 lbs. That means Nicodemus was offering to pay 1560 lbs of silver if he could not repay the owner with water! At current modern prices, such a weight would be almost four-hundred thousand dollars’ worth of silver. The account ends in a surprising miracle! Not only does the record describe the unexpected downpour upon Israel that refilled the wells of water and thus paid off the debt Nicodemus owed, and the seeking of Nicodemus to have the excess water amount that fell into those cisterns repaid to him by the master of the wells (rather hilarious on its own), it goes on to tell us that, by the sincere prayer of Nicodemus to the Holy One, a grand miracle occurred and the sun continued to shine after it should have already set below the horizon! The owner of the wells, by this miraculous event, was prevented from collecting what was owed him by Nicodemus. He was forced, at the end of the matter, to acknowledge that the divine intervention worked against him, and that otherwise, Nicodemus would have been forced to repay him. 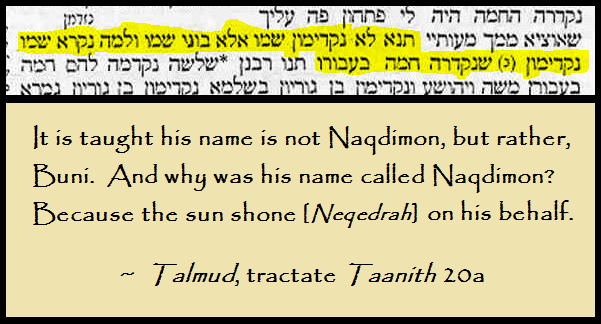 The tractate then goes on to mention further in Taanith 20a that Nicodemus was one of only three people in recorded Hebrew history (and the most recent) for whom the sun continued to shine when it ought to have gone down. 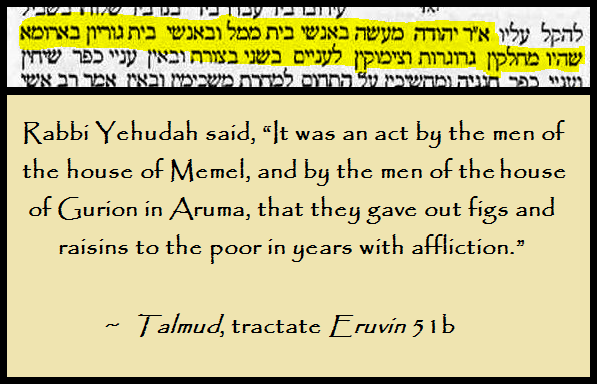 Accolade for his generosity and the resultant miracle is not lost upon the writers of the Talmud. 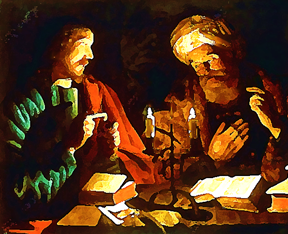 With this somewhat lengthy interruption of the meeting of Nicodemus with Yeshua, I have endeavored to highlight the powerful and sincere spiritual life of the Pharisee, and in doing so, also hopefully set a better context for the majority of the discussion that is recorded by John in the third chapter of his Gospel. The amazing miracle of the water coming down and the sun shining that the Holy One provided for Nicodemus is evidence of high favor on his behalf. It is that understanding of how much the Most High cared for Nicodemus that sets the stage for the content of the talk he and Yeshua have, where he instigates a discussion that has been argued to be the most important conversation in history. John 3:2 tells us how it happened, and exactly how Nicodemus viewed Yeshua’s ministry. Nicodemus holds nothing back in regards to the perception of Yeshua by at least some of the Pharisees at that time. Yeshua’s great works and teachings prove to Nicodemus’ mind that He is a teacher with authority from the Highest in His ministry. Although not Himself a Pharisee, the Pharisees are still able to recognize in Yeshua the marks of greatness, and how He interacts with the common people of Israel in an intimate and powerful connection. Nicodemus knew his own faith was founded in sincerity, and had an awesome testimony of a miraculous sign to validate it, and that factor caused him to see in the similar miraculous works of Yeshua the same sincere favor present from the Most High. It is therefore undeniable to Nicodemus that there is something special to this upstart teacher who is outside of his own sect of Judaism, and that fact compels Nicodemus to seek Him out to understand Him further. Yeshua proceeds to engage in a conversation that was absolutely pertinent to the background of Nicodemus, but also went far beyond what he understood of the Most High. In John 3:3-4, we read the amazing discussion. 4 Neeqadeemas said to Him, “How is an old man able to be born? Perhaps he is able to return to the womb of his mother a second time, to enter and to be birthed…? It is vital for us not to separate the content of Yeshua’s words thus far from the context of the historical account and details preserved in the Talmud about Nicodemus and what happened to him. This amazing passage from John, as beautiful and wonderful as it is, suffers greatly from a lack of context for the discussion that is recorded here. When understood properly with the key factors in mind, the conversation between Yeshua and Nicodemus takes on so much more depth than is typically given to it if the whole picture is not first considered. The very first thing Messiah says in response to the initial words of Nicodemus seems rather strange to our ears in English. In verse 3-4, we read that Yeshua says a man must be born anew, to which Nicodemus asks the rhetorical question that perhaps an old man can return to his mother’s womb and be rebirthed. Why would Yeshua start there? With no other context considered, it seems like Messiah jumps into the conversation with a strange declaration. This exchange actually sets the stage for what Messiah is going to explain to the Pharisee, and does so in an amazing manner. ​While the New Covenant writings only reference Nicodemus by that name alone, the Talmudic passage quoted previously gives us his Hebrew patronym: Naqdimon ben Gurion – that is, Nicodemus, son of Gurion. Messiah’s initial declaration to Nicodemus in verse 3 is a commentary on his family name: the name GURION arises from the Hebrew term GUR, which means “a suckling” of either an animal or human. The name of the father of Nicodemus, therefore, essentially meant “Suckling Child,” that is, a “nursing child.” Yeshua’s mention of the need to be born again speaks directly to the family name of Nicodemus! Furthermore, the patronym of the Pharisee stands out even more in connection to what Yeshua declared to him when we take into consideration a unique factor of the Hebrew and Aramaic languages concerning idiomatic expressions. In both languages, there are a group of idioms preserved in Scripture that speak to our topic in a relevant way. In those languages, if you were to say the phrase: “son of a year,” you are actually saying that the person is less than a year old. If you say the phrase: “son of an hour,” you are actually speaking of the immediate present. If you say the phrase: “son of a city,” you are actually speaking of an inhabitant of a specific city. Therefore, if the patronym of Nicodemus were to be looked at as an idiom of like manner – Naqdimon ben Gurion – it would be like saying: “Nicodemus, son of an infant.” What would “son of an infant” mean as a Semitic idiom? It would refer to a child that is not yet born! Thus, to say his name as if it were attached to such idiom would be like saying: “Nicodemus, who is not yet born.” When the reality of the meaning of Nicodemus’ father’s name is brought into the light, and then when the factor of the way similar-sounding idioms work in Hebrew and Aramaic, it makes the declaration Yeshua uttered to Nicodemus about the need to be born anew, and Nicodemus’ rhetorical response, make so much more sense! The proper context and understanding allows us to appreciate the conversation recorded in John chapter 3 in a unique, but vital way. The text continues with similar astonishing words being spoken in 3:5-8. ​5 Yeshua answered, and said to him, “Truly, truly, I say to you, that if a man is not born from water and the Spirit he is not able to enter unto the Kingdom of the Deity. 6 A thing that is born from the flesh is flesh, and a thing that is born from the Spirit is spirit. 7 Do not marvel that I said to you that it is fitting for you to be born anew. Recall that a significant miracle occurred to Nicodemus concerning water and what comes down from the heavens – rain. The faith of Nicodemus procured for him a wonder from the Most High. His desire for his fellow Israelites to worship the Holy One at Jerusalem during the festival in cleanliness was honored by the unlikely downpour of water from the heavens, and that favor was recognized both in the record of the Talmud, as well as here in the New Covenant by the entirely-relevant words of Yeshua. 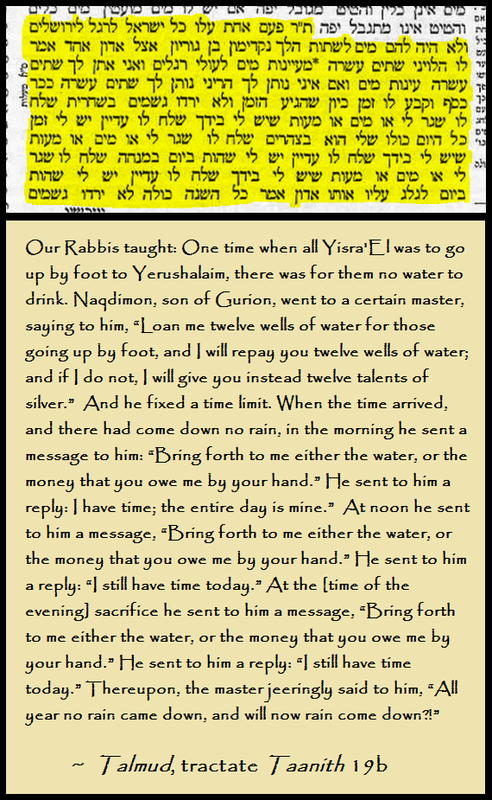 Notice how Yeshua brings up the topic of water and its importance? This is the first point the reader needs to pay attention to in the discussion. Yeshua mentions something that would not be lost upon Nicodemus, but would immediately trigger in his mind the great miracle that occurred on his behalf: water! However, Yeshua’s reference to the important place water held in the life of Nicodemus is brought up with the revelation that such miraculous favor alone is not enough to inherit the Kingdom of heaven – something else is needed: the Spirit moving [verse 5]! Nicodemus could not rely solely upon his love for his fellow Israelites to worship in purity, or his magnanimous gift of water that allowed it, nor the miracle that occurred from above that repaid his kindness. While such things are great blessings and are worthy to be sought after, they alone will not merit entrance into the Kingdom of the Most High. The Spirit must act in the life of the believer to make the person anew. The factor of the Spirit is introduced into the discussion with Yeshua using a word-play that would certainly have been recognized by Nicodemus. In verses 5-6, & 8, Messiah uses the word RUKHA, which is the Aramaic term for “Spirit,” but it is also the generic Aramaic term for “wind.” Yeshua uses the word’s double meaning back and forth, making parallel and contrast between “water and wind / Spirit” [verse 5], the “flesh and Spirit” [verse 6], and then the comparison itself between the work of the “wind” and the “Spirit” [verse 8]. In mentioning this factor of the Spirit / Wind, Yeshua was again referencing the miraculous event in the life of Nicodemus when the rain came after his prayer to the Most High. The Talmudic account of that event tells us that “the heavens covered with clouds.” This detail shows us an unwritten truth: the wind began to blow as the Spirit answered the prayer of Nicodemus. For a clear sky to be filled with rain-laden clouds, powerful winds blew and stirred up the atmosphere to create the necessary meteorological conditions to bring the rain. Nicodemus had no control over the weather, and it was the act of the Spirit that brought the wind to make the cloud-cover possible. The reference to the water and to the Spirit / wind by Yeshua spoke strongly to Nicodemus, and he was hanging on every word of the Messiah, attempting to understand it all. Now that Nicodemus’ attention was entirely focused, Yeshua was able to go further with what He really wanted to share with the Pharisee. John 3:9-15, records the amazing revelation of what was to happen to Yeshua. 10 Yeshua answered, and said to him, “You are the teacher of Eesra’El, and these you do not know? 11 Truly, truly, I say to you, that the thing that we know, we are speaking, and the thing that we are seeing, we are testifying, and our testimony you are not receiving. 12 If that which is of the earth I have spoken to you, and you did not believe, how, if I speak to you of that which is in the heavens, shall you believe? 13 And no man has ascended to the heavens, except He who descended from the heavens; the Son of Man, He who is in the heavens. 15 that every man who is trusting in Him shall not perish, but there shall be for him the life that is everlasting. Nicodemus asks a mystified question after Yeshua brings up these intricate word-plays. The response of Messiah is of great interest in verse 11: He employs the plural “we” when explaining to Nicodemus what is being experienced by Him and His students. This is a direct link back to the initiating statement of Nicodemus in 3:2, where he declared: “We know…” Nicodemus was speaking in the plural on behalf of the Pharisees, who, while not giving full support to Yeshua, were at least able to recognize that He was doing righteous signs and wonders. Yeshua’s response now in the plural was done to hint at the growing numbers of those believing in Him and performing Torah in complete purity, outside of the traditions of the Pharisees. Messiah then spoke in veiled tones of His own heavenly origin; He came ultimately from the Kingdom above, and as such, would be lifted up as a sign Himself for our healing. He mentions and likens Himself to the bronze serpent that was commanded to be made and placed upon a pole, in order to heal the people of Israel in the wilderness, recorded in Numbers 21:6-9. This may seem like an aside to His previous words, but it actually fits rather seamlessly with the context of the experiences of Nicodemus. Recall now the Talmudic account that Nicodemus experienced a miracle in the heavens with the downpour of rain. It was a miraculous sign that he was favored from heaven. When one turns to the text from Numbers 21:8-9, the word translated as “pole” is the Hebrew NES, which also means “miracle.” The snake could therefore be said to have been hung “upon a miracle.” In other words, if the text is read in this manner, it could be said that the bronze serpent was hung “in the air.” Why and how it hung suspended there could not be explained. 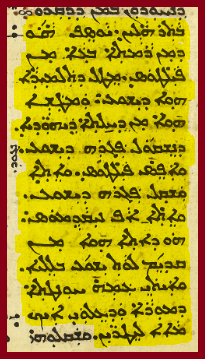 Although this is an admittedly unique way to read the text, it does appear as a suggested possible alternate way to read it in the ancient Jewish work called Bemidbar Rabbah, a commentary on the book of Numbers. With Nicodemus having had such a profound miracle in the heavens happen to him, it would make sense that this is the reason why Yeshua brings up the serpent on the pole in connection to His own upcoming miraculous moments that would happen upon the wood. Additionally, in this talk by Messiah about the miraculous lifting up and all men trusting in Him gaining everlasting life, there is a link to the sun that stayed motionless in the sky at the prayer of Nicodemus to the Holy One, for the Hebrew term used in the Talmud in that account for “sun” is not the typical term of SHEMESH that is very commonly used throughout the Hebrew Scriptures, but the lesser-used term KHAMAH, which, while having the meaning of “sun,” is also another word for “unite” in Hebrew. Just as the sun / KHAMAH was miraculously lifted in the sky for Nicodemus, so too would the Messiah unite / KHAMAH men who trust in Him with everlasting life by His own lifting on the wood! The parallels thus transition seamlessly back to the amazing spiritual experiences of Nicodemus that were shared above from the Talmud. Messiah continues His discussion with Nicodemus by making powerful statements that entirely reference that miraculous event in Nicodemus’ life. John 3:16-18 closes out their conversation with important words and references being made. ​16 For the Deity thus loved the world, that His unique Son He should give, that all who are trusting in Him shall not perish, but there shall be for him the life that is everlasting. 17 For the Deity did not send His Son to the world that He should judge the world, but that the world should have life by His hand. 18 He who is trusting in Him is not judged, and he who is not trusting, he is sufficiently judged, that he did not trust in the Name of the unique Son of the Deity. Thus far in the conversation, Messiah has used the family name of Nicodemus, as well as his experiences with the water, rain, wind, and the miracles surrounding all that, to reference what is really needed in the life of man: the power of the Spirit to restore us anew before the Holy One. At this point, Messiah utters what is arguably the most famous quote in all of the New Covenant writings: the declaration of the love of the Creator for the world by the giving of the Son for our redemption! This beautiful proclamation of our worth in the eyes of the Most High cannot be downplayed. His deep love for mankind brought Him to offer His own Son to bring us back into His Presence. Yeshua’s statement to Nicodemus follows along with the life-changing events experienced by the Pharisee, for after the miracle of the rain, the well-owner claimed that sufficient time had passed for the sun to have already gone down, even though the clouds obscured the fact, whereupon Nicodemus reentered the Temple and prayed once more to the Holy One. The content of that prayer shared previously gives complete sense to Messiah’s statement: Nicodemus prayed that the Creator would make it known that He has ones He loves in this world! Yeshua’s statement in verse 16 is a direct comment on the prayer of Nicodemus: the Israelites are not the only “beloved” in the world! Rather, the Creator loves the entire world, and wants to show favor to men from every nation, tribe, and tongue! That desire to show love to all the world came not in the sun / KHAMAH that remained in position in the sky, but in the Son who would unite / KHAMAH all men who come to Him to the Creator! Yeshua is the way provided by the Holy One for His beloved people of all races to return to Him and be a part of the Kingdom. He has given no other miracle that restores us to His Presence than His Son. Just as the sun shining canceled the debt owed by Nicodemus to the pagan well-owner, so too does the Son of the Most High cancel our debt of sin that we owe, and restore us to right-standing before the Presence of the Creator. Yeshua closes out His late-hour encounter with Nicodemus by stating these final words found in John 3:19-21, which are also full of pertinent information. ​19 But this is the judgment: that the Light has come to the world, and the sons of men have loved the darkness exceedingly than the Light, for their deeds are evil. 20 For all who perform detestations hate the Light, and do not come unto the Light, lest their deeds be rebuked. Messiah explains the judgment that is upon those who do not believe: Light has come to the world, but there are those who love the darkness more than it. This is, again, a direct parallel to the events experienced by Nicodemus: the light of the sun, thought to have already gone down, shone unexpectedly over Israel on that day recorded in the Talmud, and the master who was hoping to collect the debt owed to him by Nicodemus did not rejoice at the light, but longed for the darkness of dusk. It was Nicodemus who was longing for that light to show itself! In contrast, Messiah is the Light that has come into the world, and people were reacting accordingly: some rejoiced at the light, and some detested it. Messiah’s words were praise to those who accepted Him and an indictment to those who opposed Him. Yeshua’s conversation with Nicodemus was completely full of references to the experience of the Pharisee that so defined his life from that point on. However, the Messiah’s words, while referencing that amazing event, went further, revealing what type of experience Nicodemus was really in need of having: the power of the Spirit renewing him completely. He could not trust in former miracles or favor from the Most High to prepare him for the world to come – He needed to experience the love of the Holy One by the unparalleled act of favor that Messiah was to perform for the world! ​The second time the New Covenant references Nicodemus we find that things are turning from bad to worse for the way Yeshua is being perceived by the Pharisees and the religious elite. In John 7:47-52, some from the Pharisees are reacting to an incident where they sent guardsmen to apprehend Yeshua during His teaching to bring Him to them. The men listened and heard the powerful instruction He was giving, and then could not acquiesce to turning Him in. Instead, they returned empty-handed to the Pharisees, explaining that nobody taught like Yeshua [see my study addressing His unique teaching methods at NEVER SPOKE A MAN LIKE THIS]. The passage below picks up from that point. 47 The Preeshe’ said to them, “Why, are you also deceived? 48 Why, has a man from the leaders, or from the Preeshe’, believed on him? The text picks up some time after the events of John chapter 3, and we find that the opinion of the Pharisees towards Yeshua has only deteriorated after further interactions with Him. In fact, they have become so untoward to Him that they are openly judging Him as one whose followers are not only unlearned in the Torah, but also cursed for their approval and support of Him! It is a scathing attitude, and not in the least bit according to righteous judgment, but it is at this moment that we find Nicodemus is present when they render this opinion, and he cannot keep his silence. It merits considering that his own spiritual life had very likely undergone a transformation in the intervening time from his initial contact with Yeshua at night to this unfortunate point in Messiah’s ministry. The words Yeshua spoke to him in those late hours by lamplight would have resounded in his ears, and the astonishing word-plays and references to his own past spiritual experiences probably echoed in the ears of Nicodemus as he meditated on what all was said in that encounter. Upon witnessing the return of the guardsmen without Yeshua, and hearing their reason why they did not take Him into custody – which was due to the powerful ways of how He taught – we can only imagine that Nicodemus felt something of a kindred spirit towards them based off of his own life-changing meeting with Yeshua. It is at the premature condemnation of Yeshua’s teachings by his fellow Pharisees that Nicodemus speaks up in defense of properly performing the Torah towards Yeshua. ​The reply of the other Pharisees to Nicodemus is certainly worth noting. They sound just as accusatory to him as they did of Yeshua. Nicodemus is asked by them the rhetorical question of if he is also from G’leela (Galilee). 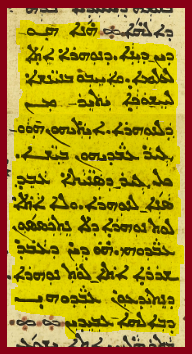 The grammatical construction in the Aramaic Peshitta here requires the answer to their question to be “no,” but there is a detail for us in Judaism’s history concerning Nicodemus that cannot be overlooked that factors into this statement they made. In the Talmud, tractate Eruvin 51b, we are told that Nicodemus’ family is actually from Galilee! 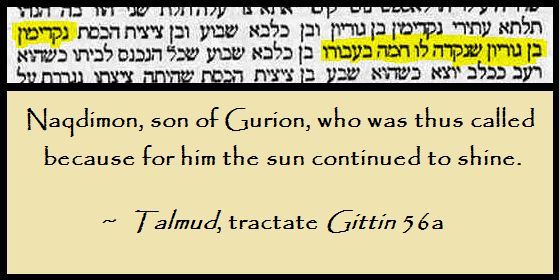 The Talmudic text mentions a place called Aruma, where the “House of Gurion” is located. This is an ancient site that is today known as Khirbet Rumeh, and sits about six miles north from Nazareth! Nicodemus was therefore a Galilean, just as was Yeshua! The biting comment from his fellow Pharisees was likely meant as a challenge to his seeming support for Yeshua. It was along the lines of: “We know exactly where you come from – don’t push your luck with us!” They were probably wary that the religious allegiance of Nicodemus was in danger of turning to the Nazarene’s growing numbers, and growled their disdain in the words recorded there in John’s Gospel. Furthermore, they finish their reply by suggesting that no prophet comes from Galilee. This statement is of interest in that one prophet did arise from Galilee – Jonah (from Gath Kheypher – some 3 miles north of Nazareth)! However, due to the complex legal nature of his mission to Nineveh, he is never actually called a prophet in the book of his namesake [see my study WHY DID JONAH RUN AWAY? for more on that], which may be a hint as to how the Pharisees were viewing the fact that Yeshua arose from the same general province, and if so, could have been a further veiled-threat “hush” on their part to Nicodemus’ defense of the troublesome Galilean! It is of some interest to our study at this point, before moving on from the tense situation of John 7, to state that the opinion of Nicodemus in the Jewish Talmud begins to also deteriorate over time. He is mentioned in explicitly positive tones in tractates Taanith and Eruvin [the first recording an event that happened before Yeshua’s ministry began, the second mention is not given enough detail to attach a timeframe], which have already been quoted in this study, but as one moves further into the massive folios of rabbinic discussion and opinion, specifically to tractate Ketubot 66b & 67a, things begin to change concerning how they viewed him. The text from that tractate tells us that some viewed his affluent status as an avenue wherein he showcased self-righteousness. The context of which he is mentioned here is in regards to the loss of his wealth near the end of his life, which the rabbis attributed to what they felt was an improper way to give charity: in order to keep him from possibly stepping on anything that would make him unclean while on route to a house of Scriptural study, they record that Nicodemus would have woolen garments laid out under his feet as he walked, and would intentionally allow those expensive woolen garments to be left behind and be immediately claimed by the poor, for their own use to wear or to sell. This act was viewed as exploitative of his riches by the rabbis of the Talmud, so that the later loss of his fortune was considered judgment from on high. Exactly what happened to Nicodemus will be addressed further in this study and with a brief return to this same tractate, but it is sufficient for now to show that while he enjoyed the peculiar status of being one of only three people in Israel’s recorded history for which the sun itself appeared to stop, as his life progressed, the Pharisaic opinion of him also was met with change – a detail the beginnings-of we see hinted at in only the second of three references to him in the New Covenant writings! ​His third and final appearance is in John 19:38-39. The setting is the grim and sorrowful aftermath of the execution of Yeshua on Roman wood. While the Messiah’s students scattered in fear of being persecuted along with their Teacher, and the hopes of so many were dashed to the ground in just a few hours’ time, we find that two unlikely men appear and take it upon themselves to stand up for Yeshua for what they certainly thought was the final opportunity to honor Him. ​38 After these, Yasef, he who was from Ramtha, sought from Peelatas, because he was a student of Yeshua, and was hiding from fear of the Yeehudaye’, that he should take the body of Yeshua. And Peelatas permitted, and he came and took the body of Yeshua. 39 And Neeqadeemas came, who came before to Yeshua at night, and he brought with him spices of myrrh and aloe, of about one hundred pounds. In an act of bold faith, the wealthy Joseph of Arimathea asked for and received the corpse of Yeshua from Pilate. There then came also Nicodemus, who stood up for Him at arguably the most dangerous moment in time, to anoint His body with preparatory spices for the burial. The amount listed is in Roman pounds, which were somewhat less than the modern 16 ounce weight, and would have equaled in modern equivalence about 75 lbs. Even so, the amount was incredibly liberal for the need, being along the lines of what would be used on royalty, which highlights exactly what Nicodemus thought of Yeshua, even in such untimely death. Indeed, his intense religious training as a Pharisee shines through in the spices he brings to use on the body of Messiah: myrrh and aloe – which are said to be used on the garments of the king in the beautiful words of Psalm 45:8. Nicodemus truly viewed Yeshua as royalty, and proved it by using the exact spices mentioned in the psalm that expressly lauds the king of Israel. We can see in this act that although Yeshua never took the throne in His first earthly ministry, Nicodemus treated Him in death as the rightful King of Israel, and honored Him as such by fulfilling the words of the psalmist concerning the garments of the king. The bringing of the spices by Nicodemus is a beautiful act when appreciated in the correct context. There is an additional detail that needs to be discussed. The timing of this horrific event centers on the Passover. The hurried and illegal trial / judgment of Yeshua by the Jewish authorities, as well as by the ruling Roman authorities, was done so that the vile deed of execution could be carried out and finished before the onset of the holy festival of Passover. The charitable and honorable deeds done by Joseph and by Nicodemus need to be viewed rightly in light of what was happening in the spiritual aspects of that day. Scripture says that when a person handles a dead body, that they themselves become unclean for a period of seven days. Numbers 19:16 explains it well for us. And any who shall be touched [by one who], upon the open field, is pierced with a sword, or by [one] dead, or by a bone of a man, or by a grave, he shall be unclean seven days. By reason of their compassion for Yeshua in taking care of His initial entombment, Joseph and Nicodemus became unclean for the next seven days. In stepping forward to attend to the body of the Messiah, they knowingly and willingly assumed an unclean status according to Scripture, and with the timing of the events, it carried a heavy price: they would be unable to perform the Passover with the rest of Israel on that evening, lest they brought uncleanness to those with whom they observed the festival. In effect, they would have to seclude themselves during the majority of the rest of the week-long festival of Unleavened Bread that immediately followed Passover, not joining in with their fellow faithful to observe in community the holy days. It is a powerful portrait of the esteem they gave to Yeshua. Especially concerning Nicodemus, who, as we have seen from the Talmud’s record, took it upon himself with great personal cost to make sure the pilgrims coming to Jerusalem would have plentiful water for drink, washing, and cleanliness purposes so they could observe the seven-day religious festival with no worries – we find the irony that he took mindful action of honoring the life of Yeshua by making himself unclean for Him, which prevented Nicodemus from observing a similar seven-day religious festival! What is interesting, however, is that although Joseph and Nicodemus made themselves unfit to observe the Passover in order to have the honor of burying the body of Yeshua and becoming unclean in the process, the Holy One provided for their self-sacrifice in the Torah by allowing such a person who is made unclean by attending to the dead to keep a second Passover one month later, as we find in Numbers 9:10-12. 11 On the second month, on the fourteenth day, between the evenings, they shall perform it; with unleavened bread and bitter herbs they shall eat it. 12 They shall not leave [any] from it until morning, and no bone of it shall they break. According to all the statutes of the Passover shall they perform it. This merciful allowance by the Holy One gave Joseph and Nicodemus the ability to perform the spiritual memorial one month after the death of Yeshua, so that they would be clean and fit to do it without fear of spreading their uncleanness from contact with His corpse. It is important to keep in mind that although they were unable to observe the festival with the rest of their brothers in Israel, when they were finally able to do it a month later, they were given the honor of being able to perform the first truly Messianic Passover in history! It can be viewed as a blessing from the Holy One for their personal sacrifice of taking care of the body of His Son. In fact, in all of Scripture, there is no other situation recorded where an individual was unable to actually perform the Passover due to having touched a corpse or been on a journey – the situation of Joseph and Nicodemus at the burial of Yeshua is the only recorded instance in Biblical history that met the requirements of the Torah in Numbers 9:10-12! Additionally, their Passover would be done in joy and renewed faith, for they would have been well aware at that time of the resurrection of Yeshua from the tomb! Also, since Yeshua did not ascend to the heavens until forty days after His resurrection, it must be admitted that He was alive and present in Israel when Joseph and Nicodemus were performing their Passover on the fourteenth day of the second month! Could it be that He met and interacted with Nicodemus further in the time between His resurrection and ascension? There are no verified historical records to show that He did, but it is an interesting thought to ponder. ​Nicodemus is never mentioned again in the New Covenant writings after John 19’s revelation of his presence at the entombment of Yeshua, which obviously cost him so much, both monetarily and personally. The Pharisee’s life was shaped by his encounters with the Messiah, however. The three times that he appears in the book of John show that Yeshua had a powerful impression upon him. It would be odd to think that he just fell back in line with the majority of his fellow Pharisees, after witnessing firsthand how they viewed Yeshua, and what they were complicit in doing to Him. In fact, if we turn again to the Talmud’s record of Nicodemus, we find some details of great interest to what we shall find happened to him later in life. 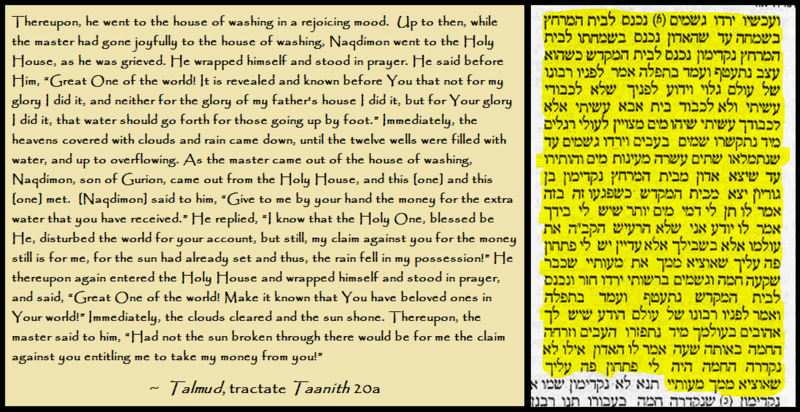 Returning once more to the Talmud’s tractate Taanith 20a, after the account of the miracle of the rain and the sun shining on behalf of his prayer to the Holy One, we find in the text that Nicodemus – or as it is rendered in the Hebrew: Naqdimon – was not his given name at all, but a nickname given to him by others to commemorate the miracle! We thus see that the Pharisee’s true name, according to the Jewish historical record, was not Nicodemus, but actually Buni! Nicodemus is the Greek form of the Hebrew nickname Naqdimon that was bestowed upon him, which came from the root term NAQAD, meaning “To Shine,” a reference to the sun that should have already appeared to have gone below the horizon, but stayed instead seemingly stationary in the sky at his supplication to the Most High. There is also a second place in the Talmud that reaffirms the reality that Nicodemus was only Buni’s nickname – tractate Gittin 56a. Thus, his true birth-name was Buni, son of Gurion! Understanding this piece of the puzzle allows us to correctly place his visit to Yeshua in John 3 as being after the miraculous event of water and light, as well, for there the Messiah refers to Buni by his popular nickname: Nicodemus, and through the wording of the content of His message, refers repeatedly to that incident and the need for a greater experience with the Holy One. These details are significant to our study, for they give us the necessary information to appreciate what Judaism has preserved as really happening to Nicodemus later in life. While the New Covenant shows us just the flicker of discord between Nicodemus and his Pharisee companions in John 7, no more is said in that inspired text of how his relationship with them turned out. The actions of the enlightened Pharisee did continue to support Yeshua, as we have seen recorded in John 19, when, in the face of both supporter and dissenter alike, he purchased a pricey sum of spices and saw to the initial burial of the executed Messiah. It is not unthinkable to consider that his compassionate deeds towards Yeshua alienated him from his religious sect who was so openly opposed to Him. There is one more passage from the Talmud concerning Buni / Nicodemus that must be shared to have a complete portrait of the man himself. In tractate Sanhedrin 43a, a sorrowful account is preserved in the oldest of the printed editions of the Talmud. In fact, due to the nature of the content that was recorded by the Jewish historians, almost all available Hebrew editions of this tractate are today censored – whether by the Roman Catholic church, as they sometimes asserted their power to do so during the Middle Ages, or by rabbinic self-censure of the texts - who did it is not certain. Some English versions will include the passage below, but the reader will be hard-pressed to verify its existence in newer editions of the Talmud in Hebrew. However, I present now an actual photograph of that tractate from one of the oldest printed editions of the Talmud still in existence – one published in Venice in 1549 – which clearly preserves the unedited text for us to see, that allows us finally to know what happened to Nicodemus. The text records the appearance of five disciples of Yeshua (in the Talmud here rendered as Yeshu) before the judges and court of the Sanhedrin – the Jewish religious ruling body of first century times. The names are given, and two should immediately stand out to us: Mattai and Buni. Mattai is the Hebrew / Aramaic version of the name we know in English as Matthew. Buni, we of course now know, is Nicodemus! Naqai, Netzer, and Todah are names not attested to in any other historical record as being disciples of Yeshua, but their unique appearance here is of no consequence, as we know that Yeshua had disciples who were not listed with the twelve (Joseph of Arimathea being one, as we read above in John 19:38), and He certainly gained many more disciples in the years after His ascension, due to the obedience of His original students to go into the world and make more disciples (the book of Acts records several more disciples by name mentioned only after Messiah’s ascension). The account from the unedited version of Sanhedrin 43a has these five disciples being brought before the Jewish court and forced to defend why they do not deserve the death penalty for their allegiance to Yeshua, whom the court viewed as a false Messiah guilty of leading people into idolatry. The method for defense was to bring forth a verse from the Hebrew Scriptures containing the name or a version of the name of the disciple that hopefully asserted their innocence. The court then was tasked with rebutting their appeal with a relevant verse showing, through similar means, that they were guilty and deserved death. Although the text does not say specifically what sources were being quoted, it becomes clear through just a bit of searching that Mattai / Matthew brought forth Psalm 43:3, and the court rebutted with Psalm 42:6. Naqai brought forth Exodus 23:7, and the court rebutted with Psalm 10:8. Netzer brought forth Isaiah 11:1, and the court rebutted with Isaiah 14:19. Buni / Nicodemus brought forth Exodus 4:22, and the court rebutted with Exodus 4:23. Finally, Todah brought forth Psalm 100:1, and the court rebutted with Psalm 50:23. 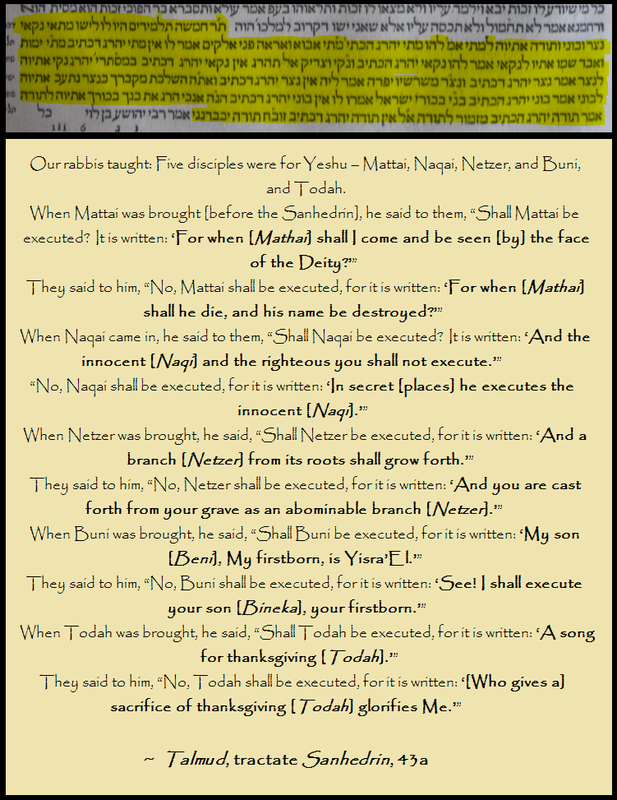 The content of the Talmudic passage gives us a glimpse of the very likely bloody end of Nicodemus: due to his support of Yeshua, the historic record no longer ascribed him accolade in calling him Naqdimon for the merit of his answered prayer so long before, as the Jewish record had been quick to once do. Instead, the tractate here refers to him only by his given name – Buni, without so much as offering up the detail that he was the son of Gurion, which all knew, thus stripping him of every semblance of honor once given, leaving him in that name as a declared disciple of Yeshua to face the court with threat of death. That the court ruled for the death of these five disciples means it would be unlikely that the decision was ever afterward reversed, but their judgment almost certainly carried out, and would fit with the historical and traditional narrative that many of the early disciples of Yeshua were persecuted and executed by their Hebrew brothers for their allegiance to Him as the Messiah. His execution for his faith would also make sense of a brief account in the Talmud, tractate Ketubot 66b, which shows us that the daughter of Nicodemus is in a pitiable state during the siege of Jerusalem leading up to its destruction in 70AD, where she is shown with no more living relatives, and with no semblance of wealth or even provision to live on. Such an account would fit with Nicodemus having been maligned by his former Pharisaic companions and subsequently executed, and thus unable to provide for his daughter at the time of her need. The portrait of Nicodemus is at last complete. The Scriptural and historical records preserved show us a Pharisee revered by Judaism and of particular interest to the Gospel writer, John. It displays a man who desired to truly worship the Holy One of Israel, and who was open to seeking out the identity of the Messiah who was to come. That openness led him to an encounter with Yeshua that contains the most-quoted passage of all the New Covenant writings. He saw beyond the obscuring opinions of his chosen religious sect unto the truths brandished by Yeshua, and subsequently defended Him before his compatriots with no hesitancy. In due time, Nicodemus even set his reputation aside and disqualified himself from performance of the Passover in order to attend to the lifeless body of the Teacher who was responsible for transforming his views on what it meant to be a part of the Kingdom. The text of Jewish historical record shows us finally that he maintained his trust in the Messiah to the point of facing certain death at the hands of men with whom he had once sat in agreement, and before them defended his position as a legitimate disciple of the true Messiah of the Most High. Paul was a Pharisee responsible for writing down much of the content of the New Covenant writings. His life was changed dramatically by his encounter with Yeshua, and there is lengthy evidence displaying what he did for the Messiah after he believed. Likewise, we know that Mark, the author of the Gospel of his same name, was a member of the sect of the Pharisees (see Colossians 4:10-11), but when the call came from Yeshua to follow, he left his livelihood and obeyed, and the result is an entire account of Messiah's ministry written by him. ​Nicodemus, on the other hand, never did write grand spiritual truths that were recorded so that the faithful could be encouraged. He did not go on to write letters to blossoming congregations of new believers in his Messiah. No, his impact is of a different type. Not everyone's walk of faith shapes the course of history. His story is a tenuous account threaded into the Gospel of John, but it is an important thread, nonetheless. In it, we find a man who was already settled and committed to a religious life before the Holy One – a life in which he had witnessed firsthand the favor of heaven and miracle the likes of which was granted only to two other men in Israel’s history. And yet, when faced with the righteous works of the renegade rabbi of Nazareth, Nicodemus knew he must have an encounter with the Man beyond the arm’s-length interactions his other Pharisees companions were experiencing. That discourse in the dark led him to realize there was so much more to the Kingdom than he was raised to believe. Nicodemus went on to defend Yeshua in the face of Pharisees who wanted Him silenced. And when no defense could prevent the heinous execution of Yeshua, Nicodemus engaged in an act of honor for the Son of David, who should have been crowned as King. This bold declaration of allegiance to the Nazarene cost him greatly: his own execution finally came years later at the hands of his brothers in the Sanhedrin, who could not accept the testimony of the turning to Messiah of Nicodemus / Buni, a Pharisee who followed Yeshua.